It's kind of a comparison to the waltz and the twist. We were the twist. 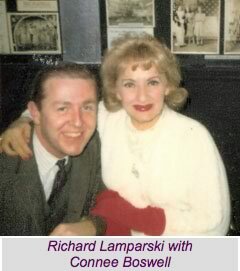 Bozzies.com is proud to feature Richard Lamparski’s 1965 interview with Connee and Vet Boswell. The famed author of the “Whatever Became Of…” series and the great new “Hollywood Diary” and “Manhattan Diary” editions has graciously allowed us to share his WBAI interview with the Boswell Sisters. Hear them tell their story in their own words…and Get Bozzed. If you would say ‘Who do the Rock and Roll singers sound like of yesterday’…you couldn’t say they sound like Ruth Etting or the Brox Sisters…You’d have to say they’re in the Boswell Sister’s groove. We revolutionized the whole style of not only singing trios, but my single work as well, and also musicians. Martha was Somaphine on Tom’s (Brenneman) show. It was called Tom and His Mule. Listen to the complete interview on the Boz Pod, or you can download the MP3 directly here.